When the Khmers ruled a large chunk of the area which later became modern Thailand, their ritual center at Sukhothai was Wat Phra Phai Luang. 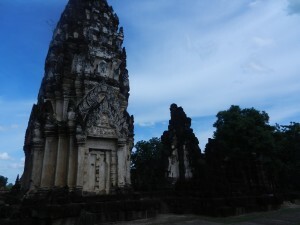 When Thais liberated themselves, they built Wat Mahathat about 1 kilometer south and made it Sukhothai’s main ceremonial area. But Wat Phra Phai Luang was still important, and they turned it into a great example of Khmer art transitioning into Thai art. Most people who go there now only spend a few minutes and move on–Sukhothai has many more temples. I spent more time there during my recent return trip than I did the first time, and it rewarded me well. 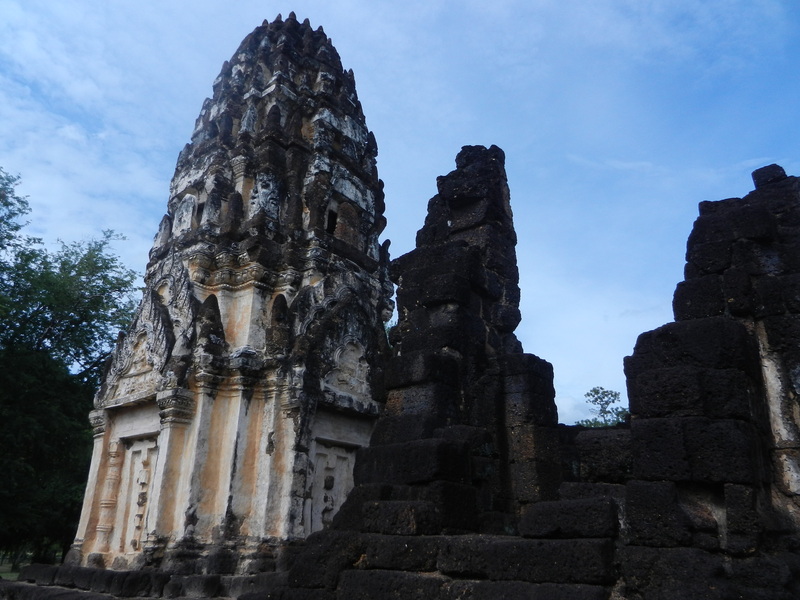 The Khmers also built Wat Si Sawai, but most of its towers were begun by Thais. The Khmers constructed the towers at Wat Phra Phai Luang, probably during the reign of Jayavarman VII–between 1181 and 1219. Like Si Sawai, it has three, but only one is well preserved. The levels of Khmer-built towers are usually more distinct. Thais turned their stupas into a more continuous flow–Chiang Saen’s Wat Mahathat is an excellent example. But Thais began to soften the surface at Wat Phra Phai Luang. 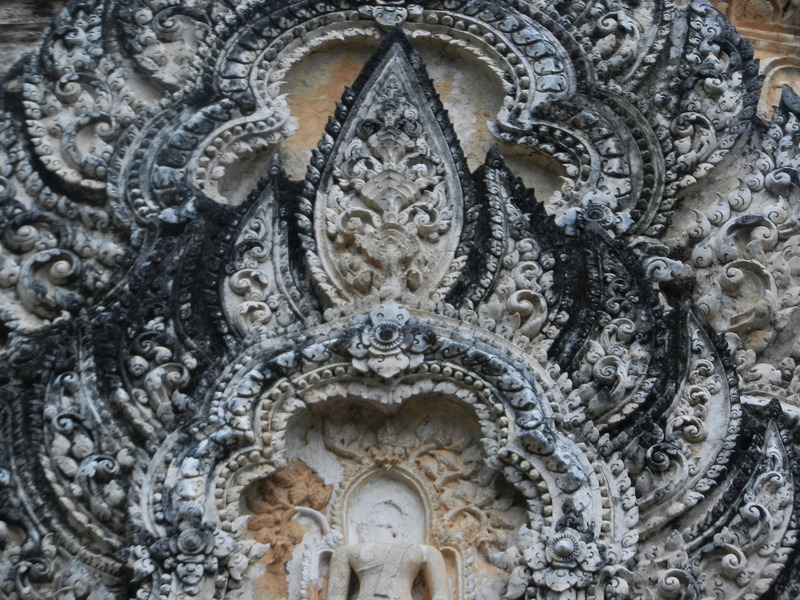 They added elaborate stucco designs in or near the 15th century with thin and flowing patterns that look like both leaves and flames–many Thai art forms were becoming long and sinuous at that time. 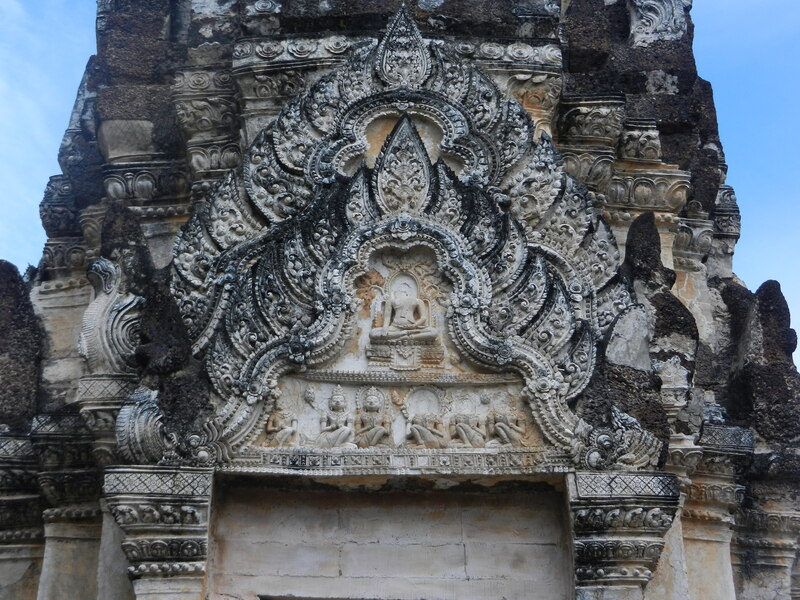 Thais also added scenes from the Buddha’s life, but softened the dignified theme. Devotees worship under him while he meditates and subdues the demon Mara. 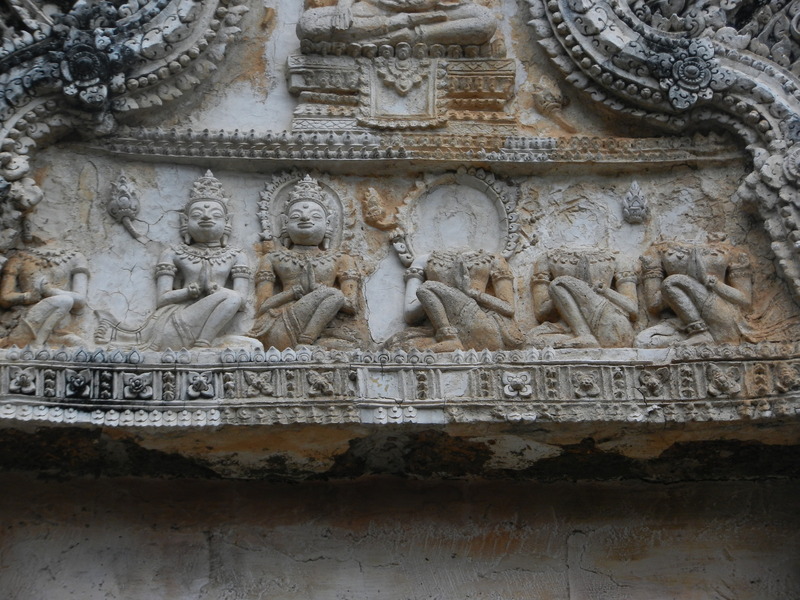 Their smiling faces look like modern reconstructions, but they fit the comical bodies, Sukhothai Buddha statues and ancient Dvaravati sculpture–all have soft, human touches. 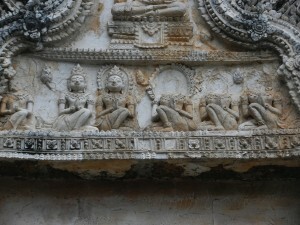 They add humor to the exuberant stucco patterns over the meditating Buddha. Thais used a lot of flowing and sinuous patterns to soften art forms. When they liberated themselves from the Khmers in the 13th century, Europeans were softening their cathedrals’ designs. But they did it with linear forms rather than wavy Thai patterns–Notre Dame Cathedral in Amiens is one of my favorites. Each culture used different basic patterns and created immensely rich artistic traditions and world-views.